Both local legend and contemporary newspaper accounts leave no doubt that despite Mr. Kojima’s denial, the Nikko Inn was, in fact, a “speakeasy” during Prohibition. It must have been quite a romantic and exotic place in those days—a rustic Japanese tea house, perched over a beautiful river, accessible only to locals or adventurous New Yorkers. Luckily, one of those New Yorkers was Karl Kingsley Kitchen, a journalist who wrote for the New York World, Photoplay Magazine, New York Sun and other papers. He was a bon vivant, famous enough in his day that there is a cocktail named after him in the classic Savoy Cocktail Book (in the section titled “Cocktails Suitable for a Prohibition Country”). In 1931 Kitchen stopped by the Nikko for some “skiyaki” and Roy Kojima was still in charge. The two started to chat and Kitchen wrote about it in his October 6 column in the New York Sun. 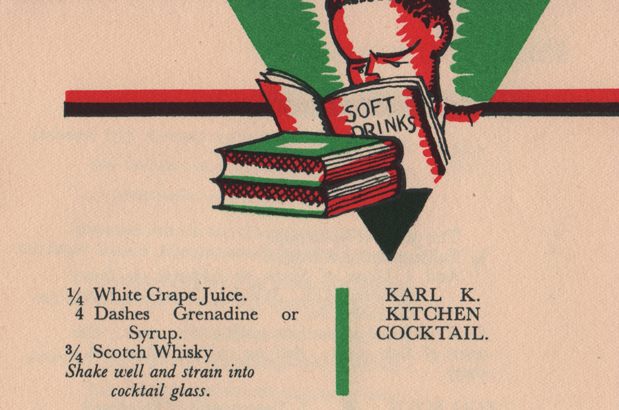 So let’s mix ourselves a “Karl K. Kitchen”, savor our illegal drinks, and enjoy this vignette of Harmon history, published 81 years ago. “When I stopped at Nikko Inn, near Harmon-on-the-Hudson, last Sunday for a dish of skiyaki Roy Kojima, its Japanese proprietor, surprised me by telling me that he was the real author of “The Million-Dollar Baby,” one of the popular song hits of the day. “Yes, I wrote it five or six years ago,” the stocky little Japanese restaurateur confided, producing a well-worn scrapbook filled with clippings of his poems. And sure enough there was a clipping from a local newspaper published in 1926 with the stanzas and with “Prince” Roy’s name above them. While the words of the song reveal a considerable variation from these stanzas, the idea of meeting the million-dollar baby in the five-and-ten-cent store is decidedly similar. “Why don’t you sue the music publishers?” I suggested after I had tasted the delectable dish—the best skiyaki I had ever tasted, by the way. However, our conversation soon drifted from popular songs to the origin of skiyaki, which Roy, who hails from Tokio [sic], admitted was invented in the rival city of Kyoto many hundreds of years ago, perhaps even 900, he conceded. 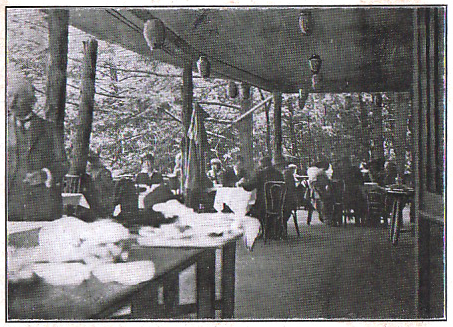 The porch of the Nikko Inn. For my benefit Roy turned on an artificial moon, which shed its rays over the beautiful little lake below his Japanese “tea” house. “I like because it reminds me of Nikko,” he said, perhaps dreaming of his far-off Nippon. “You mean it looks like Nikko might look if it didn’t look the way it did,” I corrected. But I added that the skiyaki did a lot to create the illusion. As a matter of fact this little lake with its Japanese teahouse has the most “Japaneseey” outlook and atmosphere of any spot around New York. Coming next: Some multi-talented Federal prohibition agents use a clever ruse to bust the Nikko Inn in 1922. Very nice find as always!